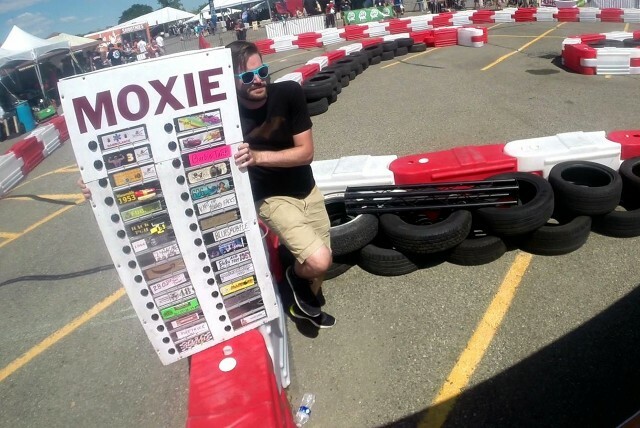 A large part of the Power Racing Series is Moxie. Moxie is best described as, being awesome. 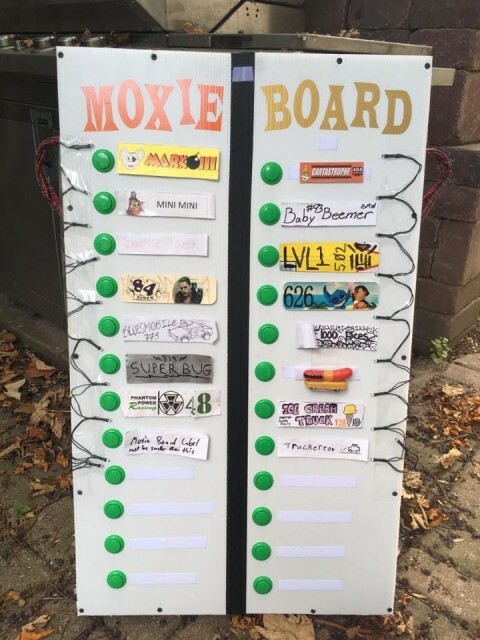 The crowd gets to vote for your car using the Moxie Board. Each button press equals a vote. Being fast is one way to get points, but another way is by being awesome… so, Moxie. As for the inside and the electronics, while the original uses an Arduino Mega with a Bluetooth module to send real-time updates to Patrick’s Android phone which is running some special app, I chose to do it differently. Failure #1: Because the Teensy is a low power device, it doesn’t draw much power from the USB battery pack we were using. I’ve seen this before, so I use a battery pack with a built-in LED “flashlight” that stays on, as long as you press and hold the button when turning it on. I told this to two people, but forgot to write instructions to put inside the Moxie Board, so there’s a chance this was not done properly and power was lost. (There is an indicator LED that lights up when a button is pressed, but not a “POWER ON” LED which would have helped… maybe. Maybe Failure #2: It could be that my code isn’t quite right. I do not have the most recent code that the official Moxie Board is running, but I have an older version that may be close. My code is a little different, but should yield the same results… I think. This is worth checking on. One more note! 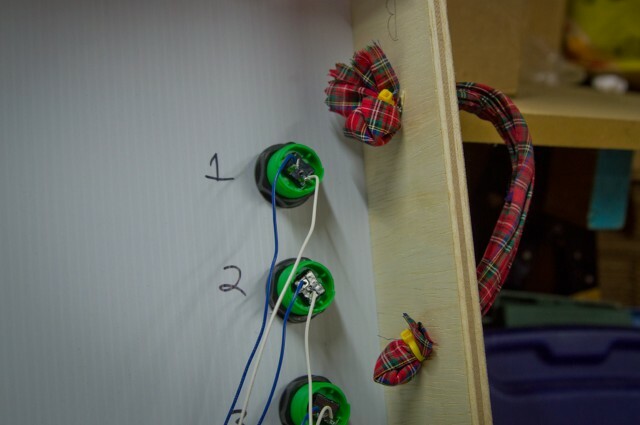 In the photo there’s a bunch of green wire and LEDs attached to the front of the Moxie Board. Those were added for the night race. 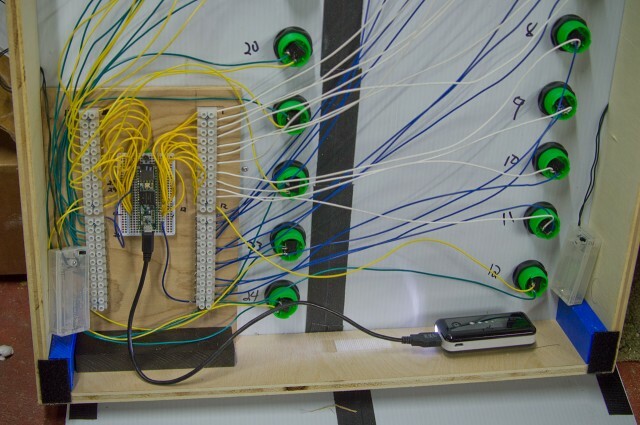 All the actual wiring for the Moxie Board is located on the inside. Posted on Wednesday, September 27th, 2017 at 10:15 pm. Subscribe to the comments feed. Both comments and pings are currently closed. Post on your own blog.